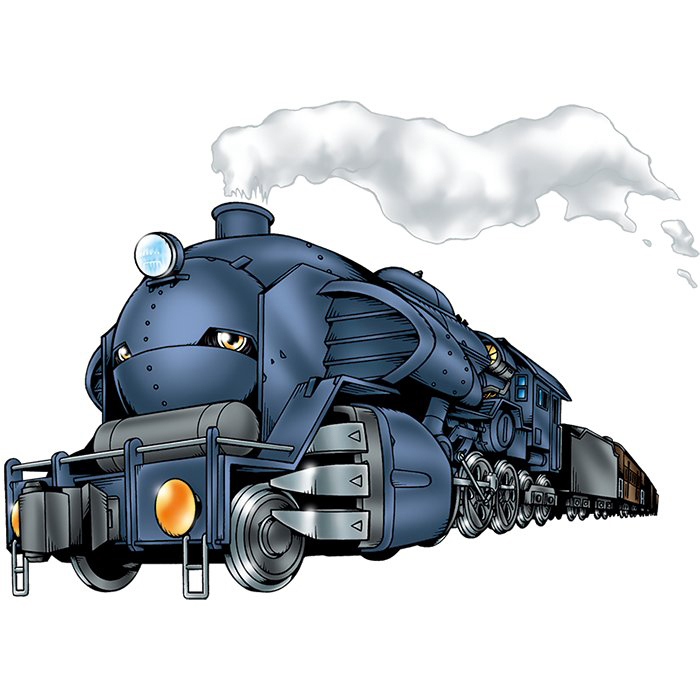 A Machine Digimon which has the appearance of a steam locomotive, its purpose in life is to keep running. It is a being which transports the data within the Network across the Digital World. 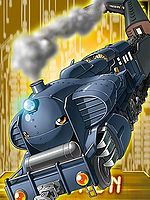 Within the Digital World, where a large quantity of information comes and goes, the meaning of life for Locomon and other Vehicle-species Digimon is in how quickly they can convey that information. 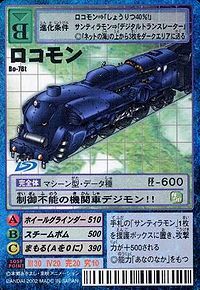 However, there are times when old models of Locomon have run completely wild as a result of seeking to go too quickly. Also, although its range of movement is confined because it can only run on rails, there are occasions when it has generated spacial distortions by continuously running in circles. 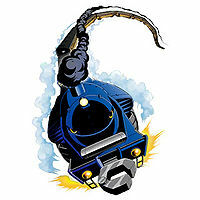 Its Signature Move, "Steam Bomb", is using bombs of the steam blowing from its smokestack. Its Special Move is spinning and then throwing spiked wheels (Wheel Grinder). n., Short for locomotive, an old fashioned word for train. Wheel Grinder  ホイールグラインダー Hoīru Guraindā Spins and then throws spiked wheels, or extrudes spinning spikes from one of its front wheels and fires them at the end of a cable. Steam Bomb  スチームボム Suchīmu Bomu Uses bombs of the steam blowing from its smokestack. A parasitic Digimon Parasimon took control of Locomon and caused it to run wild in Shinjuku, Locomon repeating that it would "keep on running". 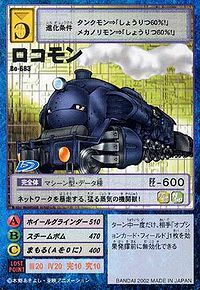 It later evolved to Grand Locomon. After Parasimon was defeated and Locomon freed, it went back to the Digital World... to keep on running, so it happened to do under Parasimon's control what it did normally. Locomon is the partner of Funabashi Kiichi. Kiichi met him at a museum for trains when he was admiring the steam locomotives. From there, they traveled to different locations in the world at night, often taking other children along. Locomon was temporarily tempted away by Tobari Ren who promised to be able to make him run faster. 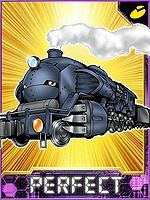 Locomon is available as a Digimon Medal. This fierce steam engine beast runs wild through the Network! 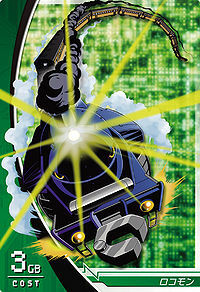 A Digimon whose life purpose is to continue running, it runs solely on the rails set out for it. Although its speed is not great, its continuous running can sometimes generate time-space distortions.